It is customary to place the acknowledgments at the end of each article describing our DX adventures. 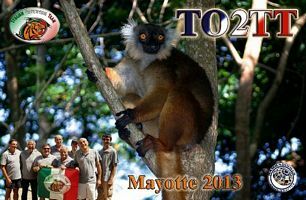 Not so this time, as we wish to emphasize our gratitude for the generous support provided by firms, ARI Sections, Associations and all hams towards another successful Expedition to the island of Mayotte, in October 2013. In fact, this Expedition was well beyond our usual budget, mostly because of shipment costs for our equipment. Despite being in the African continent, Mayotte is to all effects a French overseas territory. As such, it does not qualify for the standard facilitations offered by all airlines for shipments to Africa. In practice, the ticket fare includes just a single piece of luggage instead of two, which raises the additional expenses for the equipment to a quite considerable level. We tried to negotiate an agreement with Corsair, the airline serving the Paris-Mayotte route, but to no avail. Therefore, we reiterate our thanks to all our supporters, as well as to the contributors who will help with donations in the QSLing process. The departure date was on October 2nd, 2013. Two groups headed for the Orly airport in Paris. The first, composed of Mac (JA3USA), Gino (IK2RZP) and Stefano (IK2HKT), flew there directly. The second, including Angelo (IK2CKR), Silvano (I2YSB), Marcello (IK2DIA), Vinicio (IK2CIO) and Alberto (IZ2XAF), reached Orly by car with all the equipment. It was mid-afternoon when the whole team met at the check-in line. As always, the unusual load of equipment created some stir, but experience and a packing list well prepared by Silvano I2YSB helped a lot. On the other hand, the jam caused by the size of the tubes carrying antenna components and supports was clearly inevitable. After a quick snack we were all set up for our flight, which took off at 20:45 local. After ten hours spent in planning the actions to be carried out on arrival, we landed at Dzaoudzy at 07:35 of the following day. After short runs by bus and ferry, we reached our bungalows at the Trevani Hotel and began assembling our stations right away. Strangely enough, this time all worked out smoothly, and at lunchtime the four stations were ready, internet connected and the first antennas were showing up on the beach of the resort. The overall setup was the usual one, with only minor modifications: we brought only one spiderbeam, for the SSB station, whereas for CW and RTTY we opted for a two-element multiband Yagi. The same antennas had been used in previous expeditions where, despite their simplicity, they had performed very well. For the lower bands we used the classical ¼-wave verticals for 40m and 80m, plus and inverted-L for 160m. For receiving, this year we opted for a DHDL, since the available space did not allow for a Beverage. Something different for the 30m band: we installed a homebuilt two-element Moxon, on top of a 16m bamboo cane found on the spot (thanks to the inventiveness of Vinicio and Alberto, and the absence of environmentalists objecting to our deforesting actions…). Alberto was one of the novelties of this Dxpedition. This young ham, 22 years old and licensed just a year before, found himself parachuted on Mayotte almost for fun. One day at the local ARI Section, while chatting with Stefano IK2HKT, he mentioned some “credit” towards a trip for his completion of High School. Stefano, knowing how keen he was on radio, proposed him to spend this holiday in Mayotte. Within a day, what for IZ2XAF was just a dream had become reality. He was on the team. All team members approved and appreciated this choice, having in view our common wish to help young, motivated new hams into our wonderful world of radio. Alberto, a student of telecommunications engineering at the Polytechnic of Milano, is one of them, full of passion and enthusiasm. When he tried to explain to us too many formulas and equations, however, we had to stop him…experience against theory! Initially, we thought to give our “greenhorn” a wildcard role, planning for him RTTY operations during quiet periods, or SSB operations under reduced propagation. On the contrary, it became quite clear that he was already up to medium-intensity pileups despite his young age and limited experience. So, after a little training with IK2HKT for SSB and IK2RZP for RTTY at his side, we threw him straight into the waves (pun intended) and could witness, with great pleasure, the birth of a new passion which he will remember for a long time! Before our departure, we had studied and planned the possible openings to different parts of the world on the various bands. But forecasts are one thing, and reality is another! In fact, during all our stay on the island but for the first two days, we suffered from very poor propagation in the morning hours, from dawn to about 10 UTC: the bands opened progressively only after this time, peaking after sunset around 16 UTC. Therefore, we had to change our plans, concentrating our activity in the most productive hours and shifting the rest periods accordingly. This pushed us to the point of violating our team rule of having meals always together. Fine for lunch, but at dinner time it was unthinkable to give up S9 pileups with EU, USA and the Americas! In this context we were greatly helped by Arturo IK7JWY, our pilot station, who briefed us daily on the best opportunities for openings on the various bands, reporting hours and signal reports from correspondents scattered around the world. In addition, Arturo handled a mass of emails carrying the most diverse requests, which gave us the freedom to operate efficiently, without the burden of dealing with hundreds of questions about our activity. A great job was done by Gino IK2RZP on RTTY. He tried also on 30m on this mode, but the antenna locations, too close because of space restrictions, generated too much interference on the lower bands to make it possible. A sore note about 6m: we knew that period and conditions were not at their best, but we were hoping for the magic band to display its magic. It did not cooperate. Very few, difficult QSOs (140) to log, and we regret the missed chance for so many hams hoping to contact TO2TT for a new one on this band. We did all our best, leaving the beacon on for hours, CQing at length and watching the spots on the cluster for possible openings. Some other African countries got openings, but not Mayotte. We worked intensively on the lower bands, with many contacts with JAs on 40 and 80, both on CW and SSB. In this respect Mac JA3USA, who participated during the first week, helped a lot incrementing the number of JAs in the log, together with a privileged path between Mayotte and Japan, entirely above water. A few JAs and Ws also on 160, but with very heavy noise. Thanks to our CW operators, IK2CRR, I2YSB and IK2CIO, we managed to work all stations that we could hear! Some problems also on the higher bands towards South America, since a hill close by hindered that path. We tried to overcome this difficulty displacing a Yagi to a more favorable position, but without appreciable improvement. As a rule, we never predict or set a goal for our number of contacts, but we expected something more than we actually could achieve. At any rate, we believe that over 64000 QSOs can be considered a sound success for the Dxpedition. As always, our real-time log (tnx IH9GPI) offered the possibility to check immediately one’s contacts. This was topped by a few hours of video streaming, for the pleasure of those who could follow live our TO2TT operations (at times our server was saturated to the limit of 50 simultaneous visitors!). 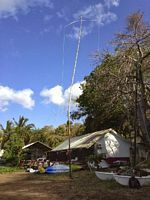 During our stay on the island we tried several times to modify the station setup, in order to adapt it to changing propagation conditions, but it turned out that nothing could be done against closed bands. We could only wait, and make the best of what became possible with maximal concentration and professionalism. We never lost sight of our commitment to provide the maximum number of amateurs with the possibility of working this country, on at least one band. So, we watched carefully the grey line, made CQ calls by areas (in particular West Coast, VK and ZL), and also gave a chance to QRP stations. We could even log some /PM stations, among them W0RW/PM in Colorado, where /PM stands for Pedestrian Mobile! Yes, some stations of this type, from a few countries, apparently enjoyed straining our ears by walking around with a portable (really portable!) TX and a rod antenna! The 13 days of operation from the Trevani village went by quickly. Almost without realizing it, we found ourselves busy with packing all our stations, under control of Marcello IK2DIA. The return leg was longer, a 14-hour flight, because of a technical stop in Madagascar. When in Paris, some of us left for Italy by car, and the others enjoyed some rest in a local hotel before continuing to Milano Linate on the following day. Of course we are already working on our next destination…we have Africa in our hearts, and it is too early to abandon it!